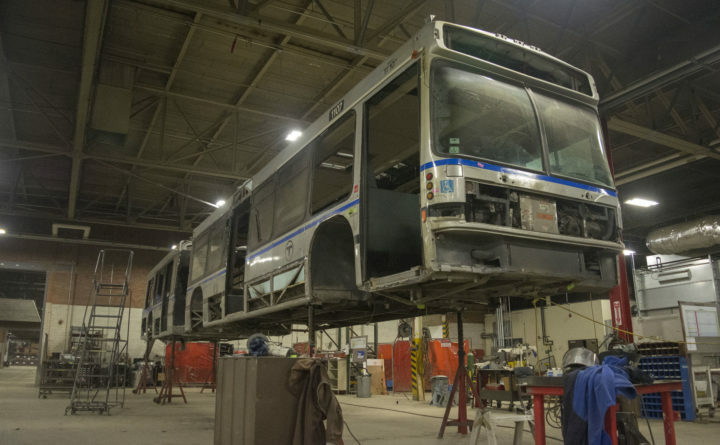 A Massachusetts Bay Transportation Authority bus is suspended in air in March 2018 as it is disassembled before being refurbished at the Maine Military facility on the former Loring Air Force base. LIMESTONE, Maine — Loring Industries laid off six employees on Thursday because of a “seasonal downturn,” according to Tim McCabe, head of business development for the firm. Loring Industries is part of the New England Kenworth group and has a parts dealership set up on the former Loring Air Force base. Loring provides bus and truck fleet life-cycle management, refurbishment and overhaul services. McCabe said that the Kenworth operation has not been affected, adding that it still has “about a dozen” employees working. Loring Industries’ most recent project involved overhauling large Motor Coach Industries buses. At this point, McCabe said that he “would rather not” mention details about any upcoming contracts before they are finalized. Because these contracts are still being negotiated, he said, he is unable to say when work will begin anew and the laid off workers called back. Loring Industries was established in 2015 to help bring and expand business in northern Miane and assisted the Maine Military Authority in a project to renovate 32 buses for the Massachusetts Bay Transportation Authority. When that project ended in late 2018, MMA laid off over 50 employees and eventually folded. Loring Industries continued to work on other projects, however, and McCabe said in early 2018 that once contracts for additional projects were finalized, he would ideally hire back as many former MMA employees as he can.